"Cars race underneath an airplane on approach for landing during the NASCAR Sprint Cup Series CampingWorld.com 500 at Talladega Superspeedway on October 25, 2015 in Talladega, Alabama." The last of anything is always bittersweet. As the year slowly winds down, I shot my last motorsport race of the year. Thankfully it ended on a high note with great teammates, lots of action and fantastic weather. Wrapping up the motorsport year at Talladega Superspeedway is always perfect. One, if not, the fastest tracks on the circuit, photographers never know what to expect - much like a plane making its landing over speeding cars. 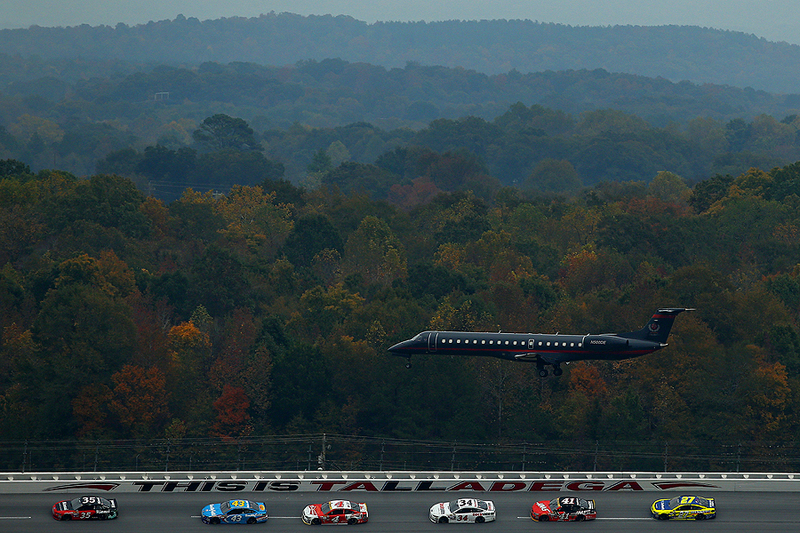 As the pack of cars raced near 200mph around turn two, this jet made its approach for landing. Probably much more stunning from ground level, I still can't help but wonder what each of their views looked like. Looking forward to see who takes home the big trophy, championship in Miami. And though I won't be shooting, I'll certainly be watching. 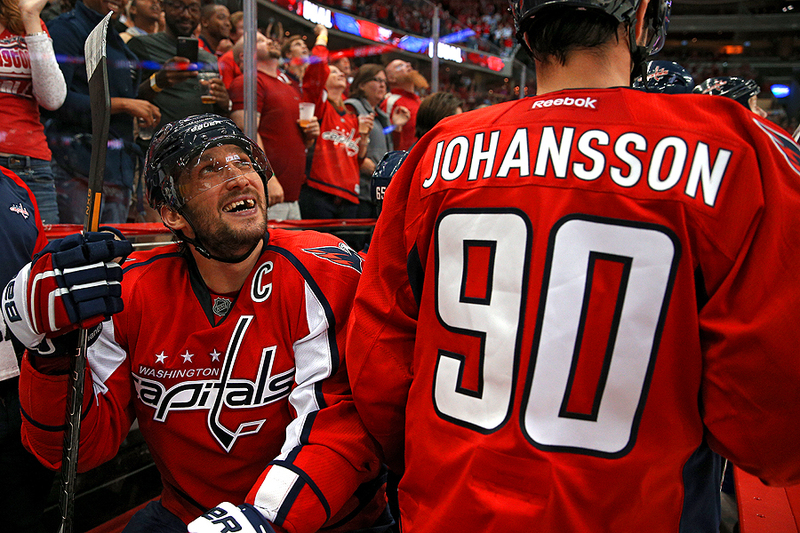 "Alex Ovechkin #8 of the Washington Capitals looks on from the bench after scoring a goal against the New Jersey Devils at Verizon Center on October 10, 2015 in Washington, DC." If there is one thing I'm trying to achieve in sports photos - it's making the viewer feel as if they were there. The best way to do that is to get close. Shooting with a wide angle lens is the easy way to achieve feeling like you're sitting or playing next to a superstar athlete. Unfortunately, that's not always an easy task in the world of professional sports. Some sports differ from others. With one you can almost touch the players, where as in with others, it still feels like there is a disconnect even for the media stationed on the sidelines. Hockey is one of those sports everyone can feel close. A small environment, fans and photographers are only separated from players by a thin piece of plexiglass. It's easy to feel and hear the action despite the barrier. In some arenas, the crash box for television exist - and photographers get the opportunity to get in there on occasion. It's the open air space between the two benches. Here there is no glass protection and it's an adrenaline rush. This vantage always produces great imagery and it's pictures like the above that help viewers feel as if they helped celebrate a goal with Alex Ovechkin of the Washington Capitals. 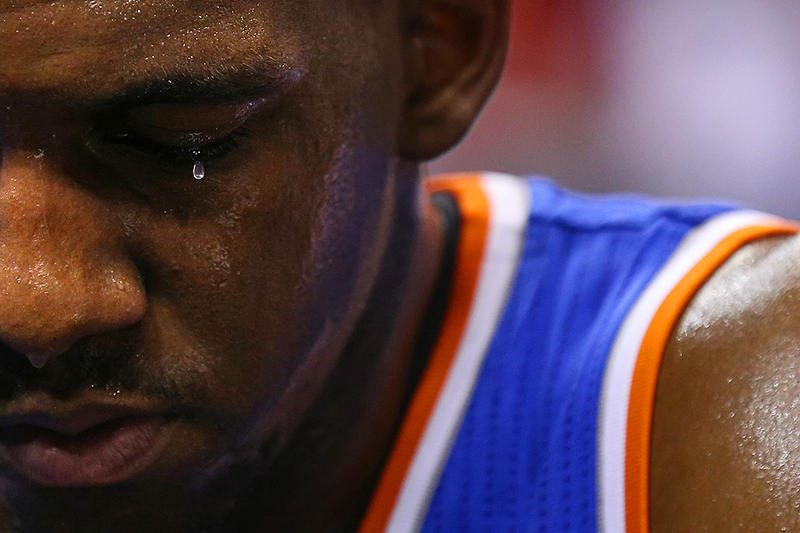 "Langston Galloway #2 of the New York Knicks has sweat drip from his eye as he sits on the bench during a timeout against the Washington Wizards in the first half at Verizon Center on October 9, 2015 in Washington, DC." 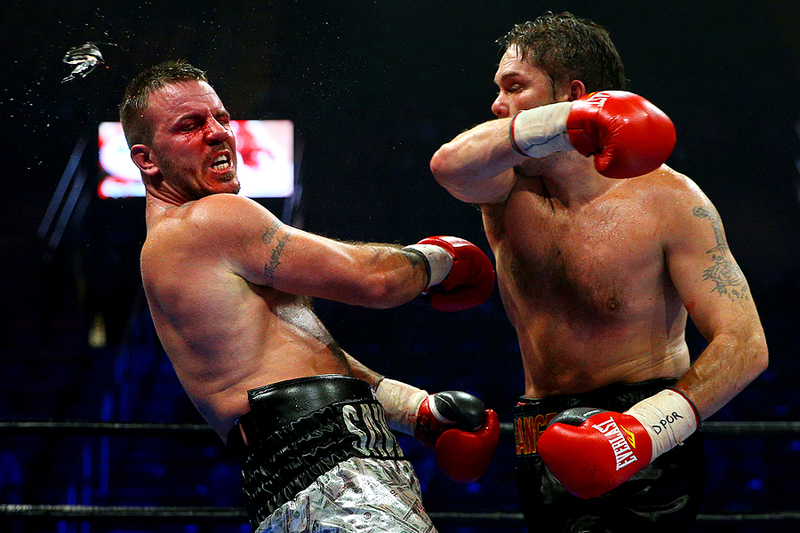 When shooting a sporting event - in the most basic sense - it comes down to the fundamentals of visual storytelling. At its core, photographers are there for a historical purpose. To document the sporting event so that there is a visual record of what occurred. Those images need to tell the story - who won, who lost - and help those after us remember what players took to the field. The images that are often remembered are the compelling emotional images - the game-winning or game-losing moment. Yet any sort of emotion draws viewers into the picture and helps them relive the play, make a connection from their own life or ask questions. Other times it's another type of picture that helps a clients needs. Whether that's a stock picture of a single player or a wide scene setting picture to give a sense of place. In other words, no single picture can meet the needs of every client. So I always try and stick to thinking about the fundamentals of photojournalism. I want to shoot: a wide shot, a medium shot, a tight shot, a scene-setter, and even a detail rectangle in my take - all within the big action, emotional moments and stock pictures. The other night, as the New York Knicks played the Washington Wizards during a preseason hoops game, I noticed the detail of sweat dripping from Langston Galloway of the Knicks - a quiet moment showing that he has been giving it all on the court. I love these types of moments in sports. Anyone can relate. But without knowing to look for in terms of basics of photography, it can be overlooked by many shooters. 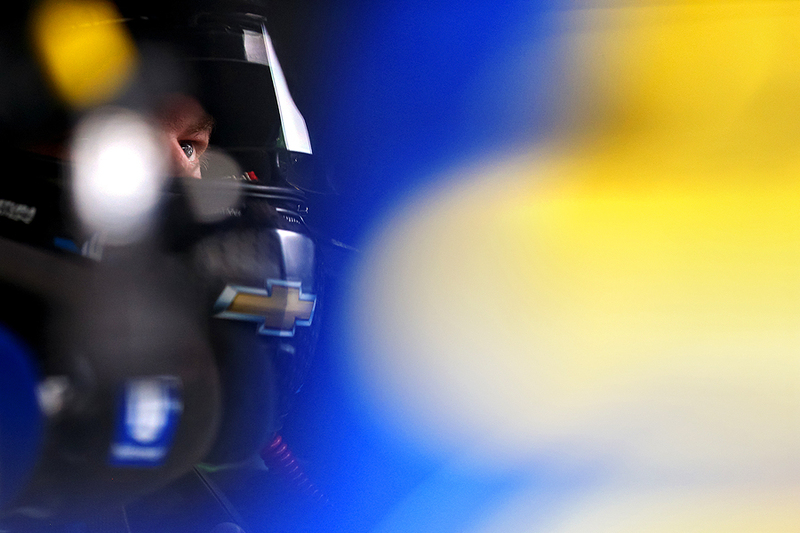 "Dale Earnrhardt Jr., driver of the #88 Nationwide Plenti Chevrolet, sits in his car during practice for the NASCAR Sprint Cup Series AAA 400 at Dover International Speedway on October 3, 2015 in Dover, Delaware." Bad weather is never good thing for stock cars driving 200mph. Unfortunately, rain put a hold on a lot on-track events prior to the NASCAR Sprint Cup Series AAA 400 at Dover International Speedway. With exception of a pair of quick practices, there was no qualifying. Other series didn't even get a chance to practice, so when it was go time to race, it was some teams first time on the oval. This was disappointing because I love the garage. A chaotic scene for those fresh to the sport, it's access and ability to be creative is endless. Find big names in the sport, search for color and make art. It's always a blast and with only a few more races on my schedule, I'll be hoping to find more views like this one as the season winds down in the playoffs. 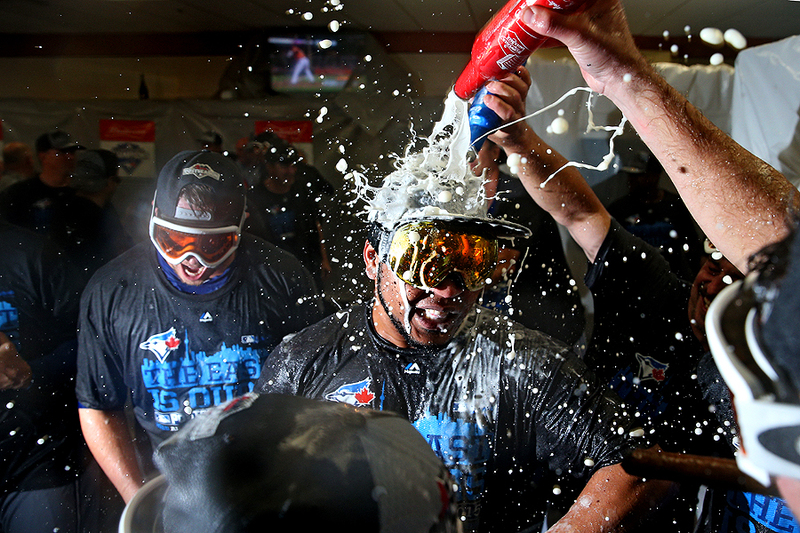 "Edwin Encarnacion #10 of the Toronto Blue Jays and teammates celebrate in the clubhouse after defeating the Baltimore Orioles and clinching the AL East Division following game two of a double header at Oriole Park at Camden Yards on September 30, 2015 in Baltimore, Maryland." Getting behind the scenes in professional sports is a rare occurrence - that is unless you're invited inside. Following a 22 year drought, the Toronto Blue Jays found themselves celebrating in the clubhouse after clinching the American League East Division. Members of the media are typically invited into the locker room in small numbers to be able to document these types of occurrences. It's always a challenging environment that's charmingly chaotic. Lots happening in a tight, dark area. Despite smelling like booze for the drive home, and having burning eyes from the same liquids, I had a lot of fun watching the team celebrate the first step to a hopefully successful post season. 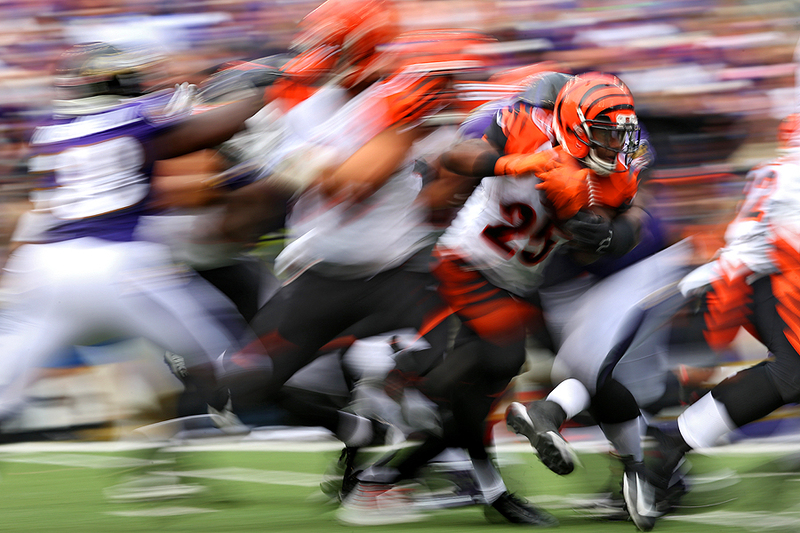 "Running back Giovani Bernard #25 of the Cincinnati Bengals rushes against the Baltimore Ravens in the second half at M&T Bank Stadium on September 27, 2015 in Baltimore, Maryland." Sometimes it's easy to forget that photography is an art. In the world of photojournalism, the moment will always be stronger than the pretty picture. Even if it has a messy background and a lot going on in the frame - the telling moment is the best moment. However, even in a world where telling stories visually is the first and foremost the most important thing, photographers should remember to bring their own style and vision to those moments. I always try to remember to be creative. Try something new. Shoot from a new angle. Or photograph a familiar scene in a different way. Recently I've been going back to the pan - slowing the shutter speed. It's all a risk and a lot of times nothing comes of it. As the Cincinnati Bengals played the Baltimore Ravens, I enjoyed the movement and colors each and every time running back Giovani Bernard pushed the ball up the field. And during this drive he went up the middle a couple of times giving me some layers elsewhere in the frame. Telling moment? To most, probably not. Yet it gives the team's take a different feel than the competition.